To say that the oft-touted "30,000 Global Warming Petition" project stinks would be the understatement of the year. I thought it would be timely to once again break down this flawed piece of global warming denier propaganda after it was mentioned last night in Daily Show host Jon Stewart's interview with US Energy Secretary of Energy, Dr. Stephen Chu. The Petition Project website offers a breakdown of the areas of expertise of those who have signed the petition. 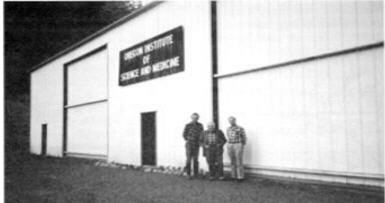 The petition first emerged in April 1998 and was organized by Art Robinson of the self-proclaimed "Oregon Institute of Science and Medicine" (OISM) [their headquarters are the Photo Inset]. Along with the Exxon-backed George C. Marshall Institute, Robinson's group co-published the infamous "Oregon Petition" claiming to have collected 17,000 signatories to a document arguing against the realities of global warming. The petition and the documents included were all made to look like official papers from the prestigious National Academy of Science. They weren't, and this attempt to mislead has been well-documented. Along with the petition there was a cover letter from Dr. Fred Seitz (who has since died), a notorious climate change denier (and big tobacco scientist) who over 30 years ago was the president of the National Academy of Science. Also attached to the petition was an apparent "research paper" titled Environmental Effects of Increased Atmospheric Carbon Dioxide. The paper was made to mimic what a research paper would look like in the National Academy's prestigious Proceedings of the National Academy journal. The authors of the paper were Robinson, Sallie Baliunas, Willie Soon (both oil-backed scientists) and Robinson's son Zachary. With the signature of a former NAS president and a research paper that appeared to be published in one of the most prestigious science journals in the world, many scientists were duped into signing a petition based on a false impression. The petition was so misleading that the National Academy issued a news release stating: "The petition project was a deliberate attempt to mislead scientists and to rally them in an attempt to undermine support for the Kyoto Protocol. The petition was not based on a review of the science of global climate change, nor were its signers experts in the field of climate science." Given all this it seems to me that anyone touting this as proof that "global warming is a hoax" completely misunderstands the process of scientific endeavor or has completely exhausted any real argument that rightfully brings into to doubt the reality of climate change. Or, then again, they could just be in it for the money.